The majority of the cases that are heard in the small claims court are relatively straightforward. At least one of the parties is likely to be representing himself and the costs recoverable in respect of legal advice and / or representation are extremely limited. If a claim is straightforward there may be no need for either party to use legal precedent to support their case. Due to the informal nature of a small claims hearing the judge may well focus on the facts, leaving the underlying legal basis of the claim largely unspoken. This approach will suffice if the case law on a particular issue complies with common sense or is logical. However, legal precedent can be counter-intuitive and in some small claims trials a party may need to rely on case law. If a party to a court hearing intends to rely on case law or legal precedent it is a common courtesy to inform the other side of this intention before the hearing. Any party intending to rely on a case should bring at least three copies of the case with them to court: one for their opponent, one for the judge and one for themselves. The opponent should be given the chance to familiarise themselves with the case before the hearing starts. Some case law can be particularly persuasive in one direction or another: there is always a chance that the other side will be prepared to reach an agreement based on the ruling contained in the case. If the case is referred to during the hearing a copy can be handed to the judge – who will probably ask whether the party has shown the case to his opponent. If a party is certain that they will refer to the case they could ask the court usher to pass a copy to the judge before the hearing. The informality of the small claims court will allow the judge to consider any case law relied upon and decide whether it is actually relevant to the claim. This will assist a litigant in person as sometimes a case may seem pertinent at first glance but on closer inspection is not. Some judges will take exception if a legal representative for one party tries to use an obscure legal precedent when the other party is a litigant in person. Guidance has been given on the use of legal authorities to limit unnecessary reliance on case law but to ensure that the interests of justice are maintained. In many court hearings a “skeleton argument” is required if a party or their representative intends to rely on legal precedent. The skeleton argument identifies the legal proposition contained in the case on which the party seeks to rely. Whilst it is unlikely that a judge in a small claims hearing would expect parties to have prepared skeleton arguments it is equally unlikely that he would expect the parties to come to court with a stack of case law for his perusal. Where to Find Case Law? Many public libraries have good legal sections containing text books on different areas of the law, as well as sets of legal reports which contain transcripts of cases. If a text book mentions a case that appears to support the claim, the case can be photocopied from a book of law reports. The website of Her Majesty’s Court Service has links to sites from which transcripts of judgments can be downloaded. Sometimes putting the name of a case into an internet search engine will also produce a copy of the transcript. 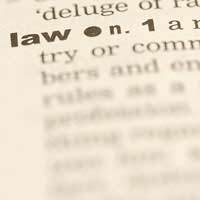 Trite Law - Is it Necessary? Many small claims cases are based on fundamental legal precedents which are so well established that the parties will not be expected to refer to them. When a legal issue is so well known as to go without saying it is often described as trite law. If a party produces a transcript of such a case, the judge is unlikely to give it any more than a cursory glance. I am taking my Town Council to court in the Small Claims Court. I have just submitted the information required in Annex B to standard directions and have provided a copy of every document that contains information that I may want to use in court, the defendant on the other hand has merely made the statement that "all documents that they wish to rely on in court are contained in Annex A to the claim", i.e. the list that I sent. with my original claim. Is the judge likely to accept this as they have not file the document with the court nor have they provided me with a copy, so I have no idea of how many of the documents they wish to rely on, seems to me they are being lazy and using a "catch all" phrase.